When we think about hiking in Europe, first what comes to our minds are Alps. But there are other Alpine-like spectacular mountains in central Europe. High Tatras are one of the most beautiful mountain ranges in Europe. Divided between Poland and Slovakia, they are the highest mountains in this part of Europe. For me, High Tatras are one of the best places to hike in Europe. The additional advantage of this European mountain region are low prices - Poland and Slovakia are one of the cheapest places to travel in Europe. Now let's have a look at the most beautiful High Tatras hiking trails. I dare to say that because of their beauty and exciting elements, some of them are the best hikes in Europe. When I was preparing this list I took into consideration not only landscape from the mountain top but also additional elements of the trails which add to their beauty and make the hike even more interesting. Rysy peak is one of the most popular High Tatras hiking trails. It is the highest mountain in Poland (it reaches 2499m) and can be climbed from Poland and Slovakia. Rysy is a mountain massif which consists of 3 peaks, the highest of which reaches 2503m and belongs to Slovakia. Panorama from Rysy mountain is 360 degrees and on a sunny day, we get to admire almost 100 of Tatra peaks and 12 lakes. The climb is worth the effort. Here is a description of the hike from Morskie Oko parking in Poland. The trail in Slovakia is almost as long as Polish trail and there is a lot of height difference to hike. It is necessary to be fit to climb Rysy. However, Slovak trail to Rysy mountain is technically easier and when the weather is nice, it can be hiked even by inexperienced hikers. We start our hike in the most beautiful mountain resort in Slovakia - Štrbské Pleso. We head to the trail fork (it is the upper part of the resort on the main asphalt road). We enter red trail and in about 1 hour we get to another famous Slovak Tatra lake - Popradské pleso (1500m). On our way, we can also choose a bit shorter green trail but it is not as picturesque as the red parallel path. So far the path is nice and easy. In Popradské Pleso there is a mountain hotel with a restaurant located over a picturesque lake. We choose the blue trail. It is still an easy hike and in 40 minutes we get to a trail fork - Nad Žabím Potokom (1620m). We choose the red trail which will lead us directly to Rysy peak. The views get better with every step. Also, the trail gets steeper and brittle, which can be a nuisance especially when climbing down. In about 1 hour we get to a spectacular Dolina Žabích Plies Valley. There are 3 postglacial lakes which add even more beauty to this amazing place. After we pass the valley, the trail gets steep and we see a few ladders and chains which make the hike more secure. Actually, this is the only spot which can speed our heart rate with excitement. The rocky obstacles are not difficult to pass when they are dry. However, all those chains and ladders come in handy when it is raining. Soon we get to Chata pod Rysmi mountain hut (2250m). It is the highest located shelter in Tatra mountains. It is open in the same months as trails in Slovak Tatras - June 16th to October 31st. 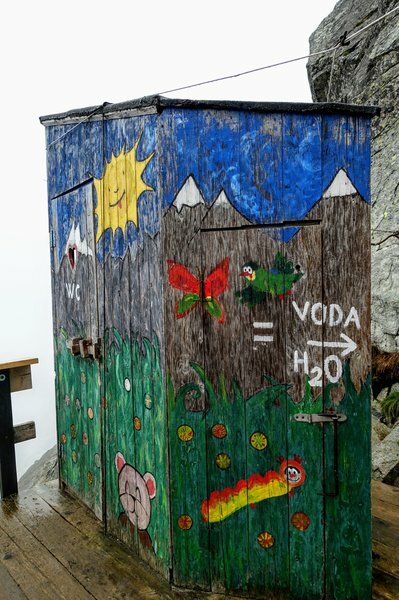 It is famous for its characteristic outdoor toilet and the fact that the mountain hut keeps getting destroyed by avalanches. The mountain hut serves food and refreshments but is often crowded, so there is a high possibility we will not get any lunch there. We set off for our final ascend - getting to Rysy peak should take us about 50 minutes. At first, the trail is a comfortable stony pavement which leads us to Váha Pass (2337m). This spot is a perfect place to take memorable photos - the view is astounding! For a few moments, the path remains rather mild and pleasant to hike. The final part of the trail gets steeper and rocky but still technically easy to climb. Rysy mountain welcomes us with a breathtaking view of High Tatras. Let's remember to climb all three peaks of Rysy massif (they are very close to each other). This is a three-day exciting hike. The below routes are flexible, as there are several mountain huts on the way. If you feel that a proposed route is too long or short, it can be easily adjusted to your preferences. We start our hike in Smokovec-Vysoké Tatry mountain village. At the beginning the trail is multicoloured but soon we get to trail fork where we follow the green trail. Nice and pleasant forest path leads us to Hrebienok trail fork (1285m) near Bilíkova Chata mountain hotel. It is possible to book a room there. In Bilíkova Chata there is also a restaurant. We continue our trip hiking on the red trail. The view gets more beautiful with every minute. In 20 minutes we arrive at another trail fork - Nad Rainerovou Chatou (1323m). There is a small mountain shelter nearby - Rainerova Chata. It is a nice rest stop but no food or accommodation is provided in this small mountain hut. We start hiking on the green/red trail. It is an easy path to hike. We cross a stream and soon get to another trail fork - Rázcestie pri Zamkovského chate (1475m). We choose the green trail and after a few moments, we arrive at another mountain hut - Zamkovského chata. Zamkovského chata mountain shelter offers food and accommodation. Contact details: +421 905 554 471 / +421 902 266 115. After a break, we continue our hike on the green trail. We head to another mountain hut - Téryho Chata (2015m). After about half an hour we get to admire the astounding view of High Tatras. The trail is still technically easy to hike but is steep - we need to do about 600m of height difference. Téryho Chata is located high in the mountains and offers the best view from all the other mountain shelters we passed. Unlike Chata pod Rysmi, this mountain shelter is open all year round. If we are already tired, we can stay in Téryho Chata. There are 24 beds available in 3 bedrooms. It is necessary to have our own sleeping bag, as only blankets are provided. There are washrooms but no warm water is available. After taking and break in the mountain hut we set off on a final part of today's hike. On our way, we get to admire not only majestic panorama of High Tatras peaks - there are beautiful Spišské lakes. The trail runs close to Prostredné Spišské Pleso lake - spectacular spot! In 40 minutes we arrive at a trail fork Kotlina pod Sedielkom (2135m). There we choose the yellow marked path and head towards our final mountain hut - Zbojnícka Chata (1960m). The yellow trail is the most exciting part of this route - there is a famous Priečne Sedlo (Czerwona Ławka) Pass. This is a difficult part. Many consider it the most difficult trail in Slovak Tatras. It is not suitable for hikers with a fear of height (exposure!). Also, previous experience in high mountains will be useful here. There are chains and metal stairs - this part resembles alpine via ferrata trails. The majority of hikers climb it without any specific equipment but it is recommended to have a helmet and gloves. The trail is two-way but we need to remember to climb it on the right-hand side. This will prevent the path from getting jammed. Also, there is not much space for the rest, so we need to climb this fragment quite fast. After we climb Priečne Sedlo Pass, the trail becomes much easier to hike, a traditional stony pavement. Getting to Zbojnícka Chata mountain shelter takes about 3 hours. This mountain hut is located in Veľká Studená Dolina (Great Cold Valley) and is open all year round. There are 16 beds. Toilets are only outdoors. Hikers can use the shelter's kitchen to prepare their food or buy meals at the restaurant. We set off from Zbojnícka Chata mountain hut on the blue path towards trail fork Prielom Rohatka (2290m). The first hour of our hike leads in a valley, the trail is scenic and not demanding. Then we get to a steep rocky trail where we have some chains to facilitate the climb. This is an exciting part and some previous experience in high mountains comes in handy. Soon after our demanding climb, we start hiking down to another trail fork - Pod Poľským hrebeňom (2110 m). When we get there we choose the green trail and start climbing up. After 15 minutes we arrive at the next trail fork - Poľský hrebeň (2200 m) where we start our ascent on yellow trail to Východná Vysoká mountain (2429m). The trail is steep but no climbing is required. In about 50 minutes our effort is rewarded with a fantastic panorama of High Tatras with its solemn peaks and beautiful postglacial lakes. Climbing down to Poľský hrebeň trail fork takes about half an hour. We start hiking down the blue trail which leads towards Sliezsky dom mountain hut (1665 m). Getting to the shelter takes about two hours. On our way, we pass two lakes - Dlhé Pleso and Velické Pleso. The trail leads among High Tatra peaks. This part is easy - it is a comfortable Tatra stony pavement. There is one steep descent close to the mountain hut but it is technically easy to hike. Horský Hotel Sliezsky Dom is a mountain hotel. Rooms are nice and comfortable, with TV and free Wi-Fi. There are a hotel restaurant and a lobby bar. The hotel even offers a wellness zone with jacuzzi pool, saunas and massages. Since it is possible to get to this hotel by car, it tends to be quite popular among tourists. Booking a room in advance is necessary. Last day of our hike. Not very challenging and technically easy to hike but very beautiful nonetheless. We sett off from Horský Hotel Sliezsky Dom on the yellow trail towards Pod Suchým Vrchom trail fork (1710 m). Getting there takes about 1.5 hours. On our right side, we admire a beautiful mountain landscape. When we get to the trail fork, we continue hiking the red trail. In half an hour we arrive at Batizovské Pleso lake (1884m). It is a perfect place to have some rest and take photos. After we pass the lake we soon arrive at a trail fork where we start climbing down the yellow trail towards Vyšné Hágy (1100m). Getting to the village takes about 1.5 hours. Vyšné Hágy is one of those small villages in Slovakia where you can get away from your everyday problems and enjoy amazing views of Tatra mountains. There are no tourist attractions, no crowds, only peace and quiet. This is the only High Tatra peak in Slovakia available for hikers in wintertime. However, we need to remember that the route is long and tiring - we need to hike 1450m of height difference. We start our hike on the blue trail which starts in Starý Smokovec center. Soon the path enters a forest. In about 1.5 hours we get to Pod Slavkovským štítom trail fork (1356m). We continue hiking the blue trail and in about half an hour the beautiful view starts to emerge - with every step we see the amazing panorama of the south. Soon we will also get to admire High Tatras. The blue trail gets steep at some points but is technically easy to hike. There are a few spots where the stony path can be a bit difficult to climb on a rainy day but this rule applies to all Tatra National Park trails. If it is raining or snowing, it is better to think twice before going into the high mountains. If the weather is favorable our effort is rewarded with a fantastic panorama of High Tatras. The last part of the trail zigzags on a steep slope and is full of rock rubble. It is easy to slip down with colluvium, so it is good to have trekking poles (so useful, especially when climbing down). If we lose the blue mark from sight we do not need to worry much - there are a few paths which connect together near the mountain top. Slavkovský štít is situated front-end to High Tatra peaks which makes it a very picturesque mountain. It is not a fast and easy hike but definitely worth the effort. There is no mountain hut on the way, so it is necessary to take plenty of water and snacks. Kriváň reaches 2495m and is a national Slovak mountain. It symbolizes Slovakia's revival and is mentioned in the national anthem and is imprinted on Slovak coins. Many hikers consider Kriváň one of the best High Tatras hiking routes - panorama from the mountain top takes the breath away. Also, there are many picturesque places on the way to Kriváň peak. It is a true paradise for mountain lovers and photographers. In my opinion, the first option is best. It is not easy, there is a lot of height difference to hike and the ascent is long and tiring. Also, there is no mountain hut on the way. But the effort is well rewarded with beautiful views. Check here a detailed description of this route. For me, this is one of the best hikes in Tatras. Important info: trail up to the Vodospád Skok waterfall is available for hikers all year. Kościelec reaches 2155m. It is also called Polish Matterhorn - it is very similar to the famous Swiss pointed mountain. Hikers can admire its full characteristic shape from Gąsienicowa Valley - scenic High Tatra valley. Kościelec looks hostile and very difficult to climb but in fact, the path leading to the mountain top is not that difficult. The majority of difficulties on this trail are caused by the lack of artificial facilitations - we are on our own, no chains, no iron steps. Up until Karb Pass (1853m) the trail is nice and easy and suitable even for beginners. Closer to the mountain top there are three problematic spots which sometimes create traffic jams on the path (especially on a rainy day). All in all, Kościelec trail is exciting and, like other High Tatra mountains, it rewards well the climbing effort. Additional bonuses on the way are Murowaniec mountain hut (great food!) and Czarny Staw Gąsienicowy Lake (1628m) - one of the best places to visit in Tatra mountains in Poland. Szpiglasowy Wierch peak reaches 2172m. For me, it is one of the most beautiful hiking trails in High Tatras in Poland. Many mountain lovers consider Szpiglasowy Wierch as one of the best hikes in Poland. This route includes Valley of the Five Lakes (1672m) and Morskie Oko Lake (1406m). Both are thought to be the most beautiful places to visit in Poland. There are two mountain huts on the way so it is not necessary to carry too much food. It is worth to remember that those shelters are open all year round but are highly popular among tourists as both are easily accessible. Fantastic panorama of High Tatra accompanies us almost during the whole hike (if the weather is favourable). There are chains in one point but this part is not technically difficult and every mountain hiker should be able to pass it without any issues. 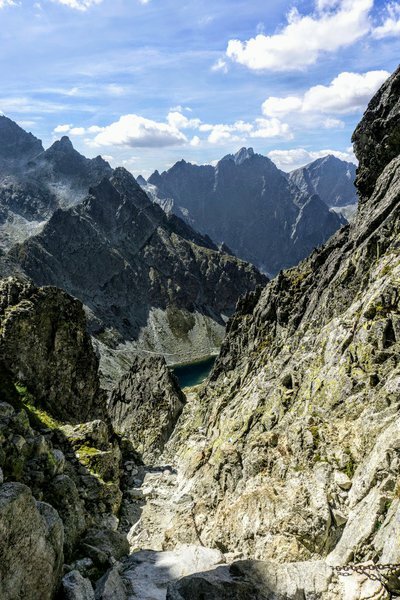 Generally, this trail is the best example of easy hikes in High Tatras. However, the route is long. A 24-kilometre long hike in the mountains is appropriate for fit hikers. I recommend to hike it in the direction given here. The more difficult part is on the yellow trail leading from Valley of the Five Lakes and it is always better to climb up harder part and walk down on the easy path. Plan well your mountain hike. Check the time of a hike, difficulties, trail description, etc. Take a paper map with you. Phones and tablets are not reliable in the high mountains. Trails in Slovak Tatras above mountain huts are closed from November 1st until June 15th. Have ICE card (In Case of Emergency card). It is a small card with contact details to a person who should be informed if an accident happens. They should also be able to provide health information about you - medicines, blood type, etc. Inform about your trip your family and/or friends. Tell them exactly where you are planning to hike. Get yourself a comfortable backpack. Take plenty of water and warm tea. Dehydration leads to weakness. Check here what to take for a mountain hike. Check weather forecast. Weather in Tatra mountains tends to be unpredictable and changes quickly. If there is a thunderstorm predicted for the afternoon, it is best to resign from the trip. Start your hike as early in the morning as possible. It is better to have a lot of time for climbing down. Also, thunderstorms are more frequent in the afternoons. Winter hiking is more difficult and dangerous than a summer trip. Prepare well. Remember about sport insurance. Rescue missions in the mountains are very costly. Avoid these common mistakes made by mountain hikers. Located very close to Štrbské Pleso lake, this hotel is a very comfortable place to stay. There are a SPA and wellness centre. The hotel restaurant serves delicious food and their selection of wines is great! Rooms are clean and spacious with free Wi-Fi. Staff is very kind and helpful. This modern four-star hotel is also located close to the lake. It has SPA facilities and conference rooms. Free parking. Continental buffet breakfast is included. Rooms are nice and clean. Apartments with equipped kitchen are also available. Great location - the hotel is situated very close to the ski lift. There are a SPA and wellness centre with an outdoor heated pool (great view!). Breakfast is included in the price. Kind and attentive staff. Free parking available. Fabulous wooden chalet located close to ski lift. Both the interior and decor are lovely - characteristic Tatra mountain wooden architecture. The perfect mountain atmosphere. The wellness centre includes a sauna and a hot tub. Buffet breakfast is abundant with many options to choose from. Comfortable and spacious rooms. Horný Smokovec is a great starting point of many hiking trails. Quiet, nice village with an added bonus - beautiful scenery. We discovered fantastic accommodation there - Panoramic Mountain Residence. This option is great if you want some comfortable luxury. It is a beautiful place offering spacious apartments with mountain view. It also has some SPA facilities and outdoor hot tub. It is situated close to hiking trails. The only drawback of this place is the fact there's no restaurant. The majority of mountain huts in High Tatras are located in Slovakia. There are only two mountain shelters in Polish High Tatras. Shelters in Tatra mountains are very popular among tourists so we need to book a room well in advance.